Update your space with the natural style of Madison Park’s Belford Microcell Down Alternative Comforter Mini Set. This ultra-soft microcell comforter is extremely soft and presents a simple design for a casual update. Matching shams complete the bedding set. The down alternative filling provides extra warmth and comfort, while the sewn-through box-quilting prevents the fill from shifting. Available in several colors, this comforter set is perfect for sprucing up your bedroom. Straight to the chase: COLOR: Ordered Ivory. What I have looks more off-white than ivory. SIZING: Chose Full/Queen. Received that--or so the packaging would indicate. There doesn't seem to be adequate drape on the side for something earmarked to fit a queen size mattress. This is further highlighted when I attempt to tuck the sides, adequately, under the mattress on a platform bed (I love the neat appearance)--there's hardly enough to wrap. Most peculiar. QUALITY: Subjective I know, but...I anticipated something reasonably close to what I viewed in photos. Didn't happen in real life. While I knew the comforter would be of lighter weight based on reviews, I didn't expect that it would mean at the expense of fill. There simply isn't enough loft to the comforter. I suspect I've been fooled by appearances via photography. Shame on me. But, intentional deception is also wrong--shame on the merchant. This set doesn't begin to come close to what is shown. The shams are also rather flimsy and lightweight--little more than thin sheets fashioned/shaped as shams. Had I paid full price for this, it would have been returned. It simply isn't worth the asking price. Since I got it for nearly nothing courtesy of using my Rewards allotment, I'll keep it and try to dress it up with toss pillows and perhaps a fringed cotton throw at the footboard. For the amount of money being asked for it however, I cannot honestly write that this is a good buy. It isn't, and I'd encourage you to think long and hard before making a purchase. I don't mean to be overly critical and I certainly don't blame Overstock. I just wanted to provide an honest and frank assessment given my own experience, and hope my words will be of help. Best wishes to all. Seriously, this is actually my first review that I've ever written! I love this comforter so much, I had to share it with you! I feel like I'm staying at a luxury hotel! It's soft, light and warm...is comfy GOODNESS....seriously....THIS is what a comforter should feel like! I want to buy one for my guest bed now! I bought an assortment of colored pillows to bring out the colors in our room...looks amazing!! Needed a new California King-sized down alternative comforter for my husband and I as we got a new bed for our new apartment. I have allergies and needed one that was down alternative, good at retaining warmth without getting too hot and this is great. Soft to the touch too. Easy to wash although one needs a fairly large-sized washer and dryer for the California King FYI. Did not receive the shams with the comforter. I purchased this last year in ivory and absolutely loved it. Great quality, amazing feel, perfect weight. This month I went to change it out for some Ralph Lauren bedding I received as a birthday gift, but as beautiful as the new bedding looks, it cannot hold a candle to my ivory comforter. The feel and weight of the Madison Park is just so perfect, so I just ordered another one, this time in blue. That way, I can use my RL sheets and shams without having to do without the comforter I love. Hands down, this is the best! Very pleased with the quality of this comforter. Fabric extremely soft to the touch and amount of fill was perfect. Ordered a king size for a queen sized bed to adequately cover bed. Bought comfort sets for my girls, they love the color and the comforter is soft and comfortable. Super Soft High Quality Comforter, I still have and use this Comforter and Shams after 3 yrs. Washes and drys beautifully, Definitely a Great Comforter for a Great Price! Still Love it!!! This is a very classic look, but the fabric isn't wonderful. It's worth the price, and fine for a guest bedroom. The softness of this comforter is great! No complaints about that. It is much thinner than the picture leads you to believe it's going to be though. Also, it is not large enough to cover our king size bed properly. It looks like we bought the wrong size to fit our bed. I will end up replacing it. Super Cozy and Washes Well! It has washed well and really held its shape. Fabric has not pilled or worn. The weight is perfect for all year use. Would recommend. 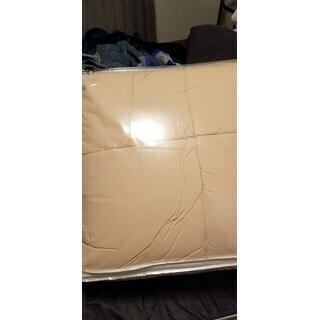 I purchased this comforter in Cal King and of course the size was King/Cal King when it arrived. The comforter is too short. The color is nice...taupe and it's very soft. I would not recommend this comforter for a Cal King bed! Extremely soft and lightweight, yet nice and warm. This was the only blanket my son used on his bed all winter. Easy to wash and dry, comes out looking brand new. Comfy! You’ll sleep like a baby. So soft. I wash it and put it back on the bed. Summer and winter. This bedding arrive quickly... but the color was no where close to a blush pink. It is more of a peach color. I did not even bother opening the package as soon as i saw it in the box i knew it was never going to work....I am very disappointed that the color was not correct. "Hi all, Wanted to know if this comforter is fluffy or flat. I have a California King duvet cover? Thanks for any help, Dee"
It is more of a flatter comforter. "Is the cover Cotton or polyester? Your description says one in one place and the other in another place." Hello CapeCod, we apologize for the confusion. The cover is polyester. Thanks for shopping with us! "Im interested in a size king color ivory. When will you have it in stock again?" Hello Olga, items are restocked as they become available; however, we cannot guarantee an item will be restocked. Thank you for shopping with us. Price and it looked comfortable. Reviews were good overall. "I can't seem to find the dimensions and at the bottom of the details it says Twin/TXL. I am looking for a comforter for my CalKing bed and want the biggest size out there to cover the bed and sides. Thank you"
Hello Medof3, If you click on the show more at the bottoms of the details box it will give you all the dimensions. Here are the dimensions for the king/cal king: King/Cal.King Dimensions: Comforter: 102 inches wide x 90 inches long Sham: 20 inches wide x 36 inches long Thank you for shopping with us. "Hello, where is this made, and is the blue a slate blue or more of a baby blue?" Thank you for contacting us, M. This is made in China. It is more of a slate blue on this comforter. Please let us know if you have any further questions.